Longtime Ketchum and Hailey Idaho, resident Scott Edward Preston, lately of Missoula, Mont., passed away at home Wednesday, March 21, 2007. He was born Feb. 25, 1959, in Kalamazoo, Mich., the son of Patricia Lloyd and James Preston. He is survived by his mother, Pat Preston; sister Jennifer Abair (husband Mohammed) and brother Paul Preston; nieces Erika and Emily, and nephew Jeremy Harnish, all of Lansing, Mich.; two daughters, Anneka Preston and Sarah McKay; grandmother Fern Preston; and former wife, Shelly Preston. His father and grandfather preceded him in death. While Scott spent his formative years in Michigan's industrial nexus, it was on his first trip to Idaho in 1980 that he fell in love with the sweeping panoramic vistas and precious vanishing cultures of the American West, a passion that remained lifelong. He also fell in love with Shelly Studley, whom he married in 1987. Their beloved daughter Anneka was born later that year. Scott had a piercing intellect, and a sometimes overpowering personality, and anyone who got to know him even slightly is never likely to forget him. A passionate and enthusiastic champion of poetry, Scott organized some of the first poetry readings to be held in the Wood River Valley's bookstores, art galleries and coffee shops, presenting guest writers like Ed Dorn, Charles Potts and Bruce Embree. 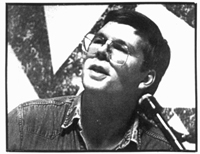 An accomplished poet and writer himself, Scott's work was published in a wide range of regional journals, and in the late 1980s he produced a weekly column for The Wood River Journal. He also founded his own Wind Vein Press at the age of 22, eventually publishing four books of poems, six issues of the literary journal The White Clouds Review, and several chapbooks and broadsides. Scott's lifelong pursuit of knowledge took concrete form when he re-enrolled in college at the age of 41, receiving a BA in English and history from the University of Montana in 2005. He was a hair's breath away from completing his master's requirements at the time of his death. The University will be dedicating a section of its library to housing a selection of Scott's vast personal collection of literature—graciously donated by his family. Scott's friends in Missoula have planned an informal gathering, to read his poems and share their thoughts, on Friday, April 13, from 3:30 - 4:30 p.m., in the Presidents' Room in Brantly Hall, at the University of Montana. There will also be a memorial service held for Scott's family and friends later this spring in Hailey. Those seeking further information about the service are invited to call 208-720-2198. "Gifted in many directions, a poet, a critic, and a wandering scholar of everything from shamanism to cowboy poetry, he was above all a warm-hearted free spirit."—Dr. Robert Baker, University of Montana, Scott's friend and professor.